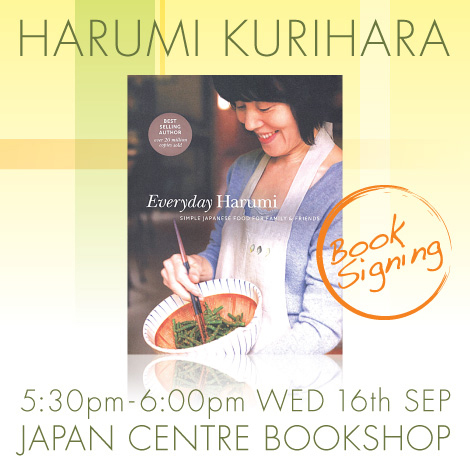 Harumi Kurihara, the world famous Japanese chef and author of the 2004 best cookbook of the year, is coming to Japan Centre to promote and sign copies of her new publication, Everyday Harumi. With over 60 brand new home-style recipes that offer a delicious fusion between traditional Japanese cuisine with modern western influences, Everyday Harumi is a perfect opportunity to get started with easy-to-make, healthy Japanese food at home! Join us from 5:30pm until 6:00pm on Wednesday the 16th September at the Japan Centre bookshop to meet Harumi, purchase her new book and get some invaluable tips about creating the most delectable home-made Japanese food. Posted in Books, Food. Bookmark the permalink.